Fool’s parsley is an annual or biennial herbaceous plant native to Europe, western Asia and northwest Africa but was introduced into North America where it has naturalized in sunny moist fields and waste places from Minnesota eastward to the coast, south to Illinois and Kentucky. 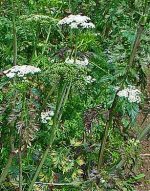 It is a member of the celery family, Apiaceae, that also includes parsley, dill, and sea holly as well as the hemlock that the ancient Greeks used for executing criminals. Description: The plants grow 1-2 feet tall and have a spindle shaped root, 3-5 inches long, hollow, striated stems, and alternate, ternately compound leaves that are glossy,dark green, lobed, and have an unpleasant odor. The small white flowers have 5 petals and are held in flat clusters (compound umbels) from summer into fall. Each flowerhead (umbellate) is subtended by three to five thin, pointed, pendant bracts that usually hang on one side. The tiny seeds are egg-shaped and finely-grooved. Poisonous Properties:Fool’s parsley contains poisonous alkaloids including cynapine that can cause heat in the mouth, redness in the lining membrane of the gullet, and windpipe, stomach aches, and vomiting, as well as coldness and numbness starting in the feet and spreading to the whole body. Consuming a small amount can cause serious problems and consuming a large amount can cause death. Deaths of humans has resulted from eating the leaves or roots when mistaking the plant for parsley.